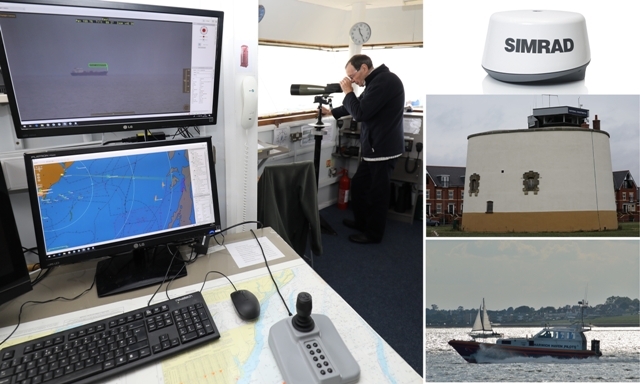 Cambridge Pixel is supplying its RadarWatch coastal surveillance software and target tracker to the National Coastwatch Institutions (NCI) Felixstowe station. The new equipment will significantly improve surveillance capability and help to protect lives along the local coastline. The combination of Cambridge Pixel’s SPx tracker and the RadarWatch display application will allow automatic slew-to-cue of cameras to targets detected by the two Simrad radars covering the south beach and the River Deben entrance. It will also provide the NCI watchkeepers with an integrated screen display of radar video, tracks, camera and AIS ship transponder data. This consolidated display will ease the burden on the watchkeepers and enable faster, clearer and better-informed decisions. Felixstowe Coastwatch is one of 54 stations around the UK’s shores and is located on top of Martello Tower P and manned by a team of 55 highly trained volunteers (3 volunteers per shift). The team keep a watch over the sea and beaches for small vessels, wind and kite surfers, and swimmers in distress. They also monitor radio channels and report incidents to HM Coastguard at Dover. Ian Clarke, Felixstowe Coastwatch, said: “The new equipment will greatly improve our watchfulness over the Felixstowe coastline, particularly our surveillance of the entrance to the River Deben, a local trouble spot where boats can run aground. We have one of our radars and a CCTV camera on a 9-metre mast at this location and RadarWatch enables the camera to swivel and follow targets detected by the radar automatically, a very difficult and time-consuming exercise to do manually. RadarWatch is designed for coastal surveillance, small port & harbour security applications. RadarWatch can display tiled maps, S57/S63 electronic charts, video from up to two radars and 16 cameras, within multiple windows and across multiple screens. It is compatible with a wide range of radar scanners, including those from Kelvin Hughes, Simrad, Terma and Furuno, and provides a common software architecture that can be scaled to single or multi-sensor installations. The RadarWatch software accepts open data formats such as ASTERIX and NMEA-0183 and works with other Cambridge Pixel software applications, including SPx Fusion, SPx Camera Manager and SPx Radar Data Recorder. Augmented vision is also implemented within RadarWatch to fuse primary radar tracks with data from ship (AIS) and, where appropriate, aircraft (ADS-B and IFF) transponders and then display this as an overlay to camera video.